Having experimented making fresh cranberry sauce here, to make cherry sauce should be similar and easy too. 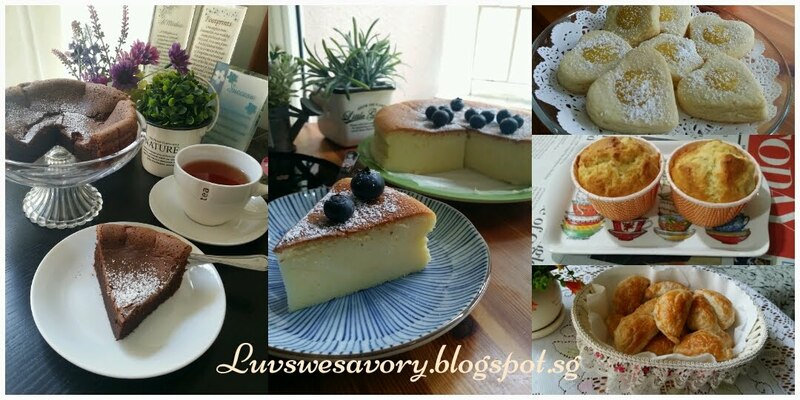 Just needed to adjust the sweetness and texture. As I didn't have any whipped cream on hand, it would not be as tasty like Mini Mango Fruit Tarts. So, I quickly made the cherry sauce and glad that these cherry puff pastry tarts turned out nice for our weekend afternoon snacks. To prepare filling, combine the cherries, sugar and about 100ml of water in a small saucepan over medium-low heat. Cook for about 10 minutes with stirring occasionally. Off the flame and allow the mixture to cool. Preheat oven to 180°C. Position the rack in the center. Prepare a baking sheet with lightly greased parchment paper. Sprinkle some plain flour on the work surface. Place the pastry sheet on the work surface. *Note: I didn't thaw the pastry sheet. Leave for about 2 minutes after taken out from the freezer, as I find it easier to handle. Poke some holes at the base using a fork. Spoon the cherry mixture on top of the puff pastry sheet, leaving one inch border. Roll the borders inward to create a dent. Lightly brush the border with the beaten egg. Bake for 18 to 20 minutes, or until pastry puffs up and turns golden brown. Fresh from the oven. Looks yum ! Serve it plain or dust with some icing sugar/Snow powder, or top with some ice cream if you like. 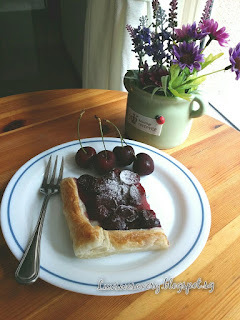 I'm sure you'll enjoy this easy cherry tart whichever way. 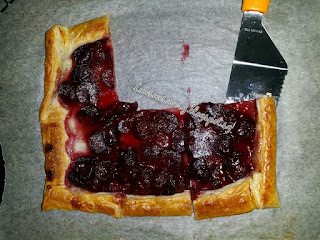 Well, those easy cherry tarts happened to be my last bake as I had to issue a "death certificate" to my "over-worked" oven few weeks ago .... hee... hee... So, I'll be taking a break from baking until I could find the right size for the built-in oven. Oh no... sorry to hear that your oven is retiring. Buying a new one? I was happy when my previous oven was died... LOL! This means I can be a more fanciful oven!!! LOL! Ha ha ! 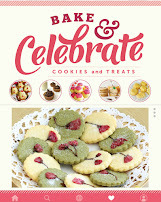 Zoe, I was happy too but realised need to find the exact size as built-in oven ... need time to shop around. Oh dear Karen, your oven KO hah..hah.. Hope you get a new one soon. Your cherry puff pastry tart looks very yummy. Wish I can have a slice! Hi Phong Hong, ya my oven KO liao ! So sorry to read about the death of your oven! But I think shopping for a new one will be really fun! :D This cherry tart looks super delicious! How did you pit the cherries manually? I don't have a cherry pitter. Yes pit manually using the larger end of chopstick, place on the stem-end of the cherry and pushed it through. Thanks for the tip Karen! Will give it a try when cherries are in season! Oh gosh Karen, sorry to hear about your oven. 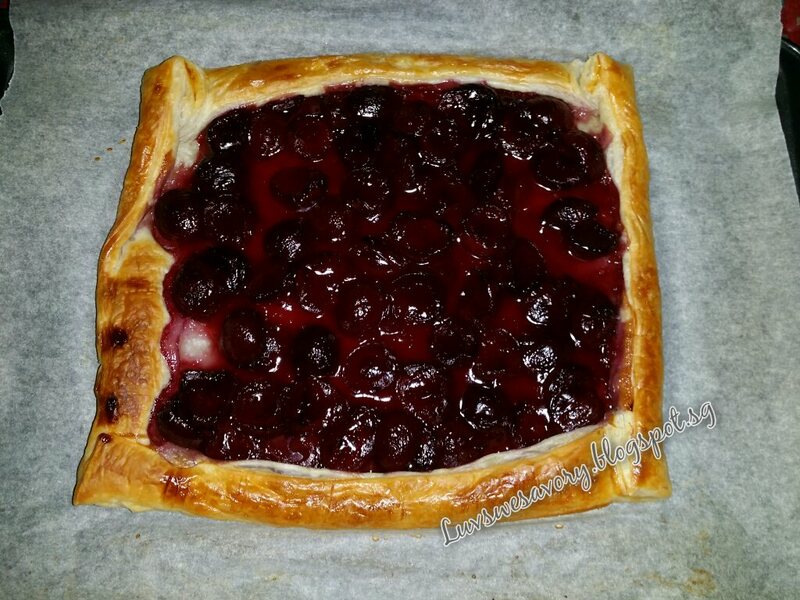 Your Cherry Puff Pastry Tart looks delicious. I did make cranberry sauce from scratch. I may just be ready for cherry sauce soon. Thank you so much for sharing, Karen...Good Luck finding a new oven. Have FUN! Wow your Cherry Puff definitely make a good tea time! My mouth is watering, Karen. That one right out of the oven looks droolworthy. Hi Karen, oh so sorry about your oven it seems like you are always baking something fabulous. 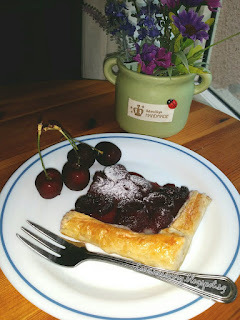 Cherry sauce sounds yummy and make it into a tart, is wonderful indeed! Good luck with your hunt for a new oven! Hope you can find what you are looking for! 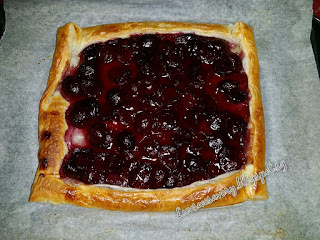 Cherry Puff Pastry Tart looks yummy! The old has to go before the new can come. Hope you find the right size oven to fit in.